Vapid Taxi, taxi, in one form or another, been in all the games the GTA series and is now available in GTA 5 and GTA Online. In GTA 5, Taxi service is nothing but a variant of the machine Vapid Stainer. It is equipped with a engine FRV8, volume of 4.6 liter, 5 speed transmission and rear-wheel drive chassis. Taxi has good dynamics of acceleration, accelerating from zero to 100 km/h in 8.1 seconds, a decent maximum speed 230 km/h, excellent strength and adequate brake system. Sitting behind the wheel of Vapid Taxi, the player, as well as every game in the GTA series, can work as a taxi driver, for fun or to earn some cash. The actual prototypes for Vapid Taxi served: 7-th generation Chevrolet Impala and Ford Crown Victoria, 2011. 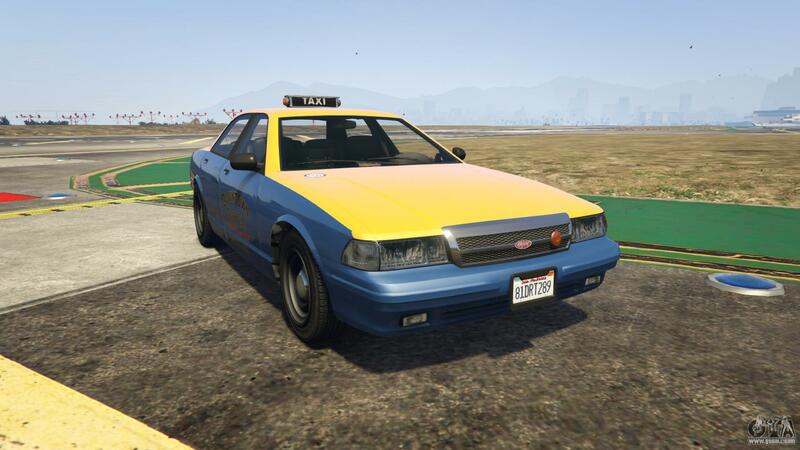 Taxi can be called using the phone, also, this machine appears periodically in all locations GTA 5. Especially often it can be seen in the Central areas of Los Santos. Features Vapid Taxi from GTA 5.